As a graduate of Cooperative Paws and Service Dogs, Inc. I am pleased to expand my services to include service dog training. NOTE: The fees associated with training your service dog may be tax deductible. Please consult with your accountant for the most up-to-date tax laws pertaining to training of service dogs. 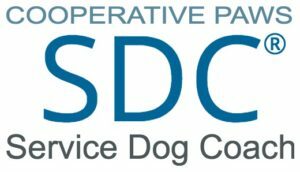 What is a Service Dog Coach? Knowledgeable about the different types of service dogs and tasks they might be expected to perform. Actively works with a client's health care or rehabilitation providers. Understands the service dog laws and regulations as established by the American with Disabilities Act. Able to attend training sessions. Able to commit to daily practicing with your dog between appointments. Aware that you may end up with a service dog that can only help at home or in places pets are allowed. Willing to wait until I evaluate your dog's suitability for public access before using any service dog identification on your dog. Have a disability as defined by the American with Disabilities Act and can obtain documentation from your physician stating such. Have support from your health care provider for use of a service dog. Understand that at any time, we may need to discontinue our service dog training due to unforeseen circumstances. Minimum one year and under four years old. Passed Canine Good Citizen evaluation within six months. Passing temperament evaluuation during "Step 2 - Team Evaluation". No history of aggression towards people, dogs or other animals. No history of any serious behavior problems.